Shire Pharmaceuticals – LAC Project Fit-out Works – Duggan Brothers Ltd.
Duggan Brothers has been awarded the contract for Shire Pharmaceuticals Ireland LAC Project Fit-Out Works as part of the construction of a new Biopharmaceutical Manufacturing Facility. The contract value is approximately €7.5 million. The development on the Biopharmaceutical Manufacturing Facility comprises of a main facility block with associated ancillary buildings. The main campus block consists of three buildings adjoining together to form the main facility for the site. The new facility block includes a new warehouse building, a laboratory, administration, canteen building and a manufacturing building. The new Biopharmaceutical building will be designed to support multi-product operations on a campaign basis. 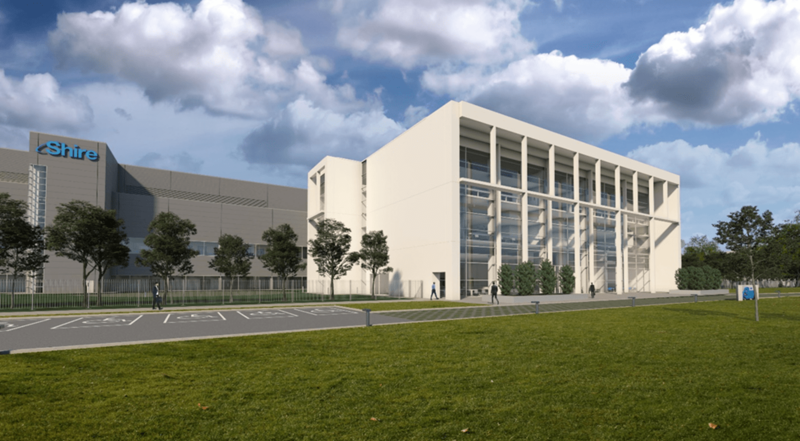 “We are delighted to be undertaking the LAC Project Fit-Out Works, as part of the construction of this new Biopharmaceutical Manufacturing Facility for Shire Pharmaceuticals Ireland”. The project envisages the delivery of a state of the art of fit-out of the labs, offices, canteen and reception area for this flagship development by Shire which will be finished to the most exacting quality standards. The project will be delivered through the use of BIM which will facilitate the extensive coordination of services with architectural fit-out. Duggan Brothers experienced on-site BIM team will play an instrumental role in achieving this.